Viglink, which helps publishers make money by putting links on their content, said Tuesday that it's integrated with vBulletin, an Internet Brands company that is the platform used by 100,000 forum websites. If you recall, Viglink works with publishers, say VatorNews, and puts outbound links on keywords, like iPad, and sends those links to sites, like Apple. If a person reading the article clicks on iPad and ends up buying the tablet on Apple, then VatorNews gets a cut of that affiliate fee, which is anywhere between 4.5% and 8.5% of the sale, according to Oliver Roup, founder and CEO of Viglink, in an interview. While VatorNews is not working with Viglink, the company does have a number of websites it does work with, though Roup would not disclose the figure. Roup would only say that currently, Viglink is doing half-a-billion outbound clicks per month compared to a billion outbound clicks last year. Clearly, the deal with vBulletin enables Viglink to ramp up those clicks it drives to its merchants. Today, its merchant list is up to 30,000 (Amazon included), which is twice that of its closest competitor, Skimlinks, said Roup. VigLink takes roughly 25% of the affiliate fee paid out by partners, such as Apple or Amazon, and the publisher gets the remainder. 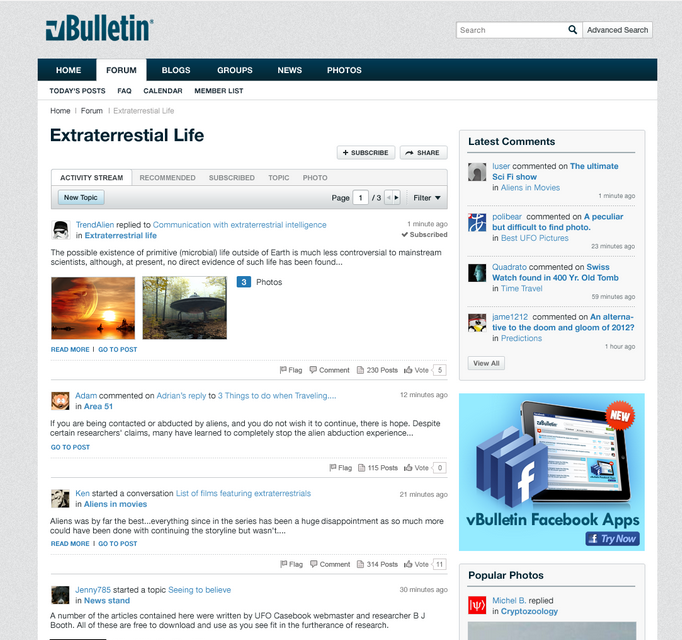 VBulletin is a publishing platform for forum publishers. It's similar to Wordpress, which is mainly used by those who want to publich blogs. But vBulletin is used by those who want to publish forums, such as FlyerTalk.com, SplitCoastStampers.com and Healthboards.com. "Forum sites are among the best sites to talk about products and monetize wll with Viglink," said Roup. Sites that monetize well include product and service-centric sites, review sites, hobbyist sites, consumer electronics and fashion sites. It's often the case that on these sites, users are making recommendations, said John McGanty, General Manager, vBulletin. While it's unclear how many of the 100,000 sites will sign up to integrate Viglink, vBulletin has made it a no-brainer to integrate, said McGanty. (See example of a forum below.) In addition, McGanty believes that outbound links could work well to monetize user-generated content. That's because user-gen content doesn't typically attract a lot of advertising dollars. McGanty wouldn't disclose what kind of click-through-rates or conversion rates he's had with vBulletin, only to say that the several sites using Viglink have had "success." In fact, vBulletin has dropped Skimlinks, in favor of Viglink. While vBulletin is beefing up its platform to include ways for its forum publishers to make money, it's also working on a new revamp that includes social tools, such as Facebook likes and Facebook Connect. There's also mobile optimization and improved search cabalities, along with 125 other new features and enhancements. VBulletin makes money by charging its forum publishers an one-time fee of around $250 to use its platform. With the new service, which will be available in a few months, vBulletin can go back to its publishers and offer them an upgrade.